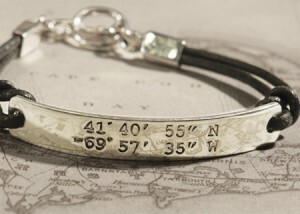 Our exclusive custom customized Coordinate Bracelet™ authenticates your loved one’s Sea Burial Location. 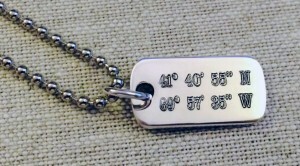 The Coordinates™ bracelet and Coordinate Tag for men shows the latitude and longitude of your loved one’s scattering with your own engraved coordinates. The sterling rectangle measures about 2.25 inches x 3/8 inches and it is available with black or brown leather. (Because the bracelet is leather and is glue-joined to the end pieces we advise you do not wear it in water.) Also please note that this bracelet is all sterling silver, not gold; the color you see is due to the reflection of the sepia tone map underneath the bracelet. For every six units ordered, get one at no charge with our compliments. It makes for a classic remembrance. Side 2: Engraved Name and / or Message.